Nothing about Kevin Butler's arrival to or departure from the Chicago Bears was quiet. Between his acquisition in 1985 and his controversial release prior to the 1996 season, Butler became the Bears' all-time leading scorer and still ranks 30th all-time in scoring in NFL history. 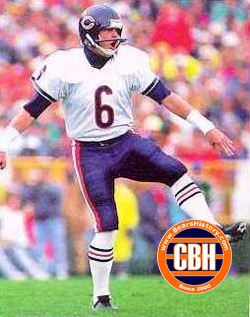 Butler was selected in the fourth round of the 1985 draft by the Bears, despite Chicago having come off a strong season from their veteran kicker Bob Thomas. After being drafted Butler told the media "I think it's unbelievable the Bears drafted me, [since] Bob Thomas had a strong year last year." General Manager Jerry Vainisi's comment on the pick was that Butler was "far and away the best player on the board in the fourth round." The fact that the Bears were so good that they could afford to spend a fourth round pick to get better at a non-need position spoke to their dominance of the league that season. Butler would lead the league with 144 points scored that rookie season as the Bears waltzed to their only Super Bowl win. Butler later said he told his wife to cancel their wedding plans for January 1986, because he knew the Bears would be in the Super Bowl. And he was proven correct. The Bears would slowly regress through the late 1980's to the early 1990's, but Butler made the position of kicker a rock that Mike Ditka could rely upon, despite the coach's penchant for launching blistering tirades whenever a kick was missed. As detailed in a great book on the late Ditka years, Armen Keteyian's Monster of the Midway, Butler did have a tumultuous 1991 season that featured a bitter contract dispute with the Bears, a DUI and his lowest field goal percentage of his career (65.5%), but he rebounded to remain a consistent player for Dave Wannstedt's retooled and crumbling Bears teams. Butler had a generally strong 1995, but as usual the team brought in training camp competition in Miami's Carlos Huerta. Bears fans were shocked when Wannstedt made the decision to cut Butler and retain Huerta following the final preseason game. "Sometimes to get ahead you don't make the easy decision," Wannstedt said about Butler's firing. The joke would be on the coach, however, when Huerta only lasted 4 games and converted only 4 of 7 attempts. The Bears legend caught on with the Arizona Cardinals in 1996 and 1997, and talked of making a comeback well after his retirement, but nothing ever materialized.